Enter your name and email to download a copy of the press release. Norwich, June 06, 2017 –Snelling Business Systems have confirmed their appointment to the Professional Systems Network International (PSNI) Global Alliance. The induction is part of a planned global expansion of the $1.4 billion revenue network; the oldest and most widely recognized commercial AV technology network in North America. Explaining the global expansion, Chris Miller, PSNI Executive Director said, “In 2016, it was decided that PSNI would underwrite an exploratory study to determine the viability of a global footprint. The findings confirmed that the timing was right for the expansion of the network to benefit current and future stakeholders”. “The ability to deliver global integration and managed services to enterprise clients through a connected network of trusted partners is now one step closer to reality for a select group of best-in-class technology providers”. As a PSNI Global Alliance member, Snelling can access the benefits of standardisation in all environments, a single point of contact for global projects, economy and quality amongst many other factors. PSNI will further build its network of technology integrators and services providers to more than 100 countries within the next three years. Following the announcement, Toby Wise explains, “I am proud to be in the vanguard of the PSNI Global Alliance, our appointment comes following winning 4 international awards in 2016/17 and PSNI’s aim is to appoint the ‘best of the best’ we are pleased that PSNI have accepted us in this capacity, and recognised us for our Infocomm award-winning design and engineering capabilities, a strong service/maintenance workforce on the ground, and a reputation for getting it done right the first time”. “To assure the highest level of success in a multi-site, multi-nation deployment, helpdesk, and NOC support, requires integrators with clearly evidenced pedigree of project management expertise, a culture of respect and trust for engaging and supporting integrator/service partners, and a desire to do their part in helping customers achieve their communication needs. Being recognised as holding these credentials makes us extremely proud at our appointment to the PSNI Global Alliance”. Anglia Ruskin University award contract for new Science Centre at Cambridge campus. Cambridge, February 13, 2017 – Snelling Business Systems have confirmed a successful bid for the provision of building-wide audio visual systems and services. The ambitious new project is part of a ‘Development Master Plan’ for the East Road site approved in 2009. Situated within the Life Sciences Centre at the Cambridge campus, the project aims to meet increasing student demand for new courses. This contract closely follows the appointment to the building-wide refurbishment of the Michael Ashcroft Building on the Chelmsford campus, as well as the ‘preferred supplier’ nomination. Snelling Business Systems win ‘Best Corporate Project’ at the international InAVation Awards 2017. Amsterdam, February 07, 2017 – Following successive awards wins in 2016-17, Snelling Business Systems have yet again been acknowledged at the InAVation Awards 2017. The Best International ‘Corporate Project of the year‘ was awarded to our flagship project, IET Savoy place. The awards, organised by the leading industry publication, InAVate Magazine, were announced at their biggest ceremony to date in Amsterdam during the ISE 2017. Snelling Business Systems were also finalists for ‘Best Education Project’ at Blavatnik School of Government (University of Oxford). Enter your name and email address to download your copy. All the updates and latest news from across the Snelling Group in Q4 of 2016. Catch up on all the latest updates and insights from across Snelling business and retail companies. It gives us great pleasure to announce our Gold Sponsorship for the SCHOMS 2017 Annual Conference at the University of Keele. 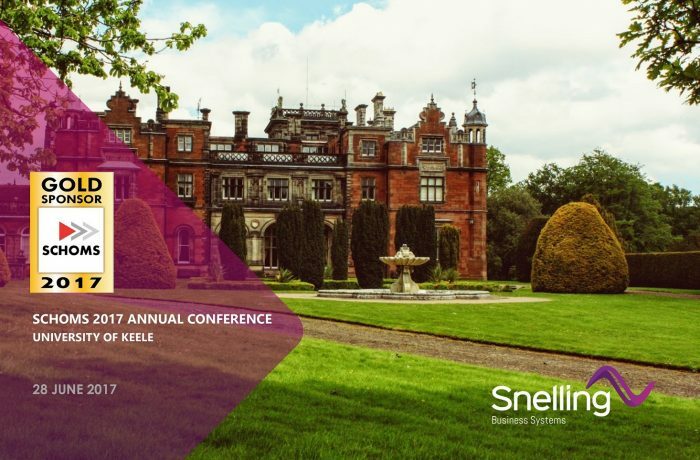 Each Year, we are proud to be associated with the SCHOMS Annual Conference to mark our on-going commitment to continue working with our existing and new clients within the Higher Education space. In 2017, SCHOMS Annual Conference will be bigger than ever before with over 40 UK HEIs. Attendees of the conference usually range from Directors and Heads of Service to Operational Mangers. The group is comprised of some of the UK’s most influential buyers in the AV and IT Higher Education Sector, who are also involved in proactively influencing innovation and change in their own institutions.